Mr. Jennifer Garner — who co-wrote, directed, and stars in this Charlestown-set story of a bank robber trying to go straight, even though he’s in too deep — may get criticized for only making movies that are based here in Beantown, but hey … why mess with success? Clearly, the guy knows the town and he makes movies that have a real sense of place and look, sound, and feel authenticious (to use a great made-up word from this film). In The Town, Affleck plays Doug MacRay, a career criminal, who falls for Claire, a woman involved in a recent bank robbery (Rebecca Hall, from Vicky Cristina Barcelona), who doesn’t realize he was the ringleader. Claire provides the inspiration and incentive Doug needs to turn his life around, but not before he tackles one last job: robbing Fenway Park. At the same time, FBI Special Agent Frawley (Jon Hamm) is hot on the trail of Doug and his gang, which also includes Doug’s BFF, Jem (The Hurt Locker‘s Jeremy Renner). 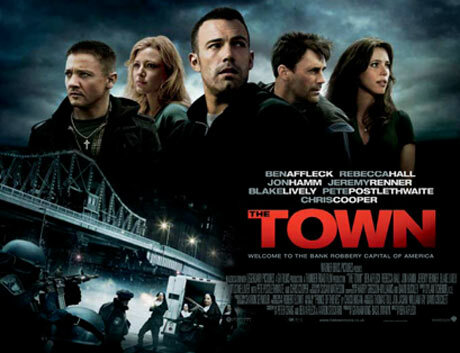 Acting in The Town is excellent across the board; in addition to those mentioned, the cast also includes Pete Postlethwaite, Chris Cooper, Titus Welliver (aka Lost‘s Man in Black), and Blake Lively, whose drugged-out townie is a long way from Serena van der Woodsen. Affleck keeps things moving, and does a particularly nice job with the robbery and chase scenes, which are staged and shot impressively. I’m not sure Affleck was right to cast himself as Doug — his portrayal of the guy is too “nice,” especially when contrasted with Renner’s hothead, which makes you wonder why he hadn’t tried to get away from it all much sooner — but another actor also may not have been so sympathetic, and as an audience member, you want to root for his character. 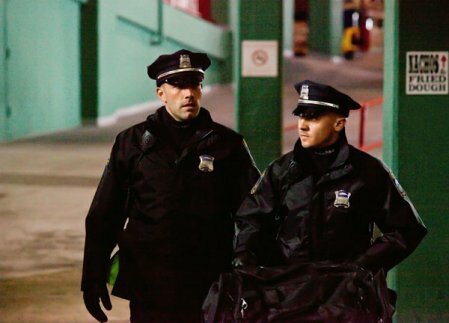 You also want to root for Affleck, and The Town gives us more reason to do so. It’s an exciting, compelling, and fun film, one that does Boston proud.